Delight the sense with our delectable purple berry crocodile skin wallet (please don’t eat it). Made from genuine crocodile leather, these striking handmade leather wallets are complimented with a contrasting black crocodile skin interior for a touch of mystery and intrigue. 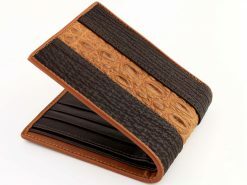 A superior exotic wallet and a popular choice for those who like something a little different from the norm. A characterful gem that gets everyone around the boardroom table talking of wild stories of conquest, travel and victories on your chosen field of battle. Don’t be caught picking up the tab with a boring old wallet, this one’ll set you apart from the rest.